As promised, a round-up of some of the research presented at the annual meeting of the Society for Healthcare Epidemiology of America (SHEA), held last weekend in San Diego. (Disclosure: I was on the faculty for the meeting; in exchange for co-hosting a session, SHEA will be reimbursing me for airfare and hotel. I wasn’t otherwise paid, though.) There were 143 presentations on MRSA; here are a few. I’m going to put in links to the online abstracts — I have SHEA’s permission to do this — but I can’t guarantee how long they will stay up. For those outside the science world, what happens at these meetings is that research is presented, in slide/PowerPoint sessions or in a poster, as a preliminary step to getting it published in a journal. Once a journal expresses interest, a cone of silence descends, the researchers are asked not to discuss the research until the paper is printed, and the abstract will probably be taken offline. The Cleveland Veterans Affairs Medical Center discovered via a routine nasal swab that a quadriplegic patient was colonized with MRSA; the patient had not had any signs that would have indicated an infection. To satisfy their curiosity over how much MRSA a healthcare worker might pick up from a patient whom they did not know was colonized, they had a health care worker do an abdominal exam of the patient — let’s underline that: abdominal; nowhere near his nose. Then they pressed the worker’s hand onto a growth medium that had been tuned with antibiotics so that it would allow MRSA to grow but suppress other bacteria. That’s what you’re looking at above. All of that red is MRSA. The image on the right is what grew after the same worker did hand-sanitizing with alcohol foam and then pressed the same hand onto an identical culture plate. What’s growing? Nothing at all. To assess the potential implications of the patient’s MRSA carriage for infection control, an imprint of a health care worker’s ungloved hand was obtained for culture after the worker had performed an abdominal examination of the patient. 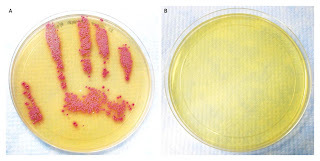 The MRSA colonies grown from this handprint on the plate (CHROMagar Staph aureus), which contained 6 µg of cefoxitin per milliliter to inhibit methicillin-susceptible S. aureus, are pink and show the outline of the worker’s fingers and thumb (Panel A). With the use of a polymerase-chain-reaction assay, the mecA gene, which confers methicillin resistance, was amplified from nares and imprint isolates. After the worker’s hand had been cleaned with alcohol foam, another hand imprint was obtained, and the resulting culture was negative for MRSA (Panel B). So his advice is brutally practical: Health care workers carry MRSA? Screen and swab them. Workers are positive for MRSA? Treat them, and take them out of direct patient contact for two weeks. That costs money? Spend the money: It’s less costly in the end than killing your patients. The stories are detailed, for a small paper — they go into depth about the cleaning measures the hospital is taking — and yet they don’t answer the questions that we here want to know. Does “tested positive” mean colonized or infected? Does “connected to the same source” mean they all have the same strain, or does it mean there is an epidemiologic link? Some readers may know that it is outbreaks among newborns that have demonstrated that the designations “community-associated” and “hospital-acquired” are passing out of usefulness. There have been several MRSA outbreaks in newborns and their mothers in the US (in New York City, Houston, Chicago, Los Angeles and Houston again because Baylor College of Medicine has been particularly alert to this) that were clearly nosocomial, and yet when the microbiology was done, were found to be caused by community strains.